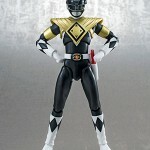 S.H.Figuarts Armored Black Ranger SDCC Exclusive Revealed! Bluefin reveals their 2nd exclusive offering for SDCC this year via facebook. As hinted at by company representatives from NYCC last year, it’s the S.H.Figuarts Armored Black Ranger from the MMPR exclusive episode an “Oyster Stew”. The footage used for this episode is part of the “Zyu2” run of episodes. Saban had licensed Toei to film new material with new monsters to be used exclusively in Power Rangers episodes because Saban had already cycled through the available material. This powered up form appears once and only in Power Rangers despite being from Japanese footage. Currently there’s no word on pricing. 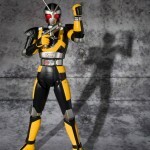 Our friends at Bluefin announced via Facebook that both S.H.figuarts Leangle and RoboRider will be available for North American distribution. Both will be coming out in August, with Leangle retailing for 36.99 and RoboRider for 34.99. Look for them at your favrioute North American online retailer or specialty shop!